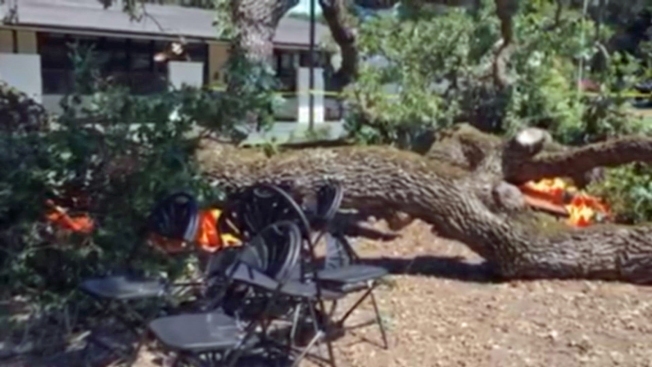 A mother and her young daughter were injured Saturday after a large oak tree branch snapped and fell on top of a crowd of people gathered for a picnic at Menlo College in Atherton, according to fire officials. Several people were hit by the falling piece of timber, and the mother and her 2-year-old girl had to be transported to the hospital, fire officials said. 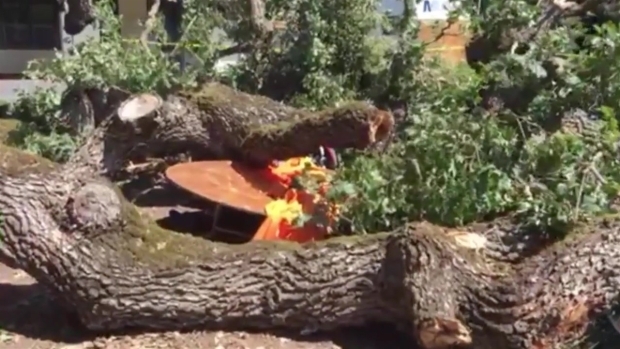 The branch, which is roughly three feet wide and 50 feet long, crashed shortly before 2:30 p.m. while hundreds of people were enjoying a company picnic with Riverbed Technologies, fire officials said. Footage from the scene captured several chairs, a children's play table and a stroller buried under thick pieces of wood and smaller branches. One other person who suffered minor injuries refused to be treated. Jason Del Rosario, a family member of two of the victims, said that his sister, Jasmine Garcia, suffered a broken toe and bruising on her shoulder. Del Rosario added that his niece suffered a fracture in her skull and lacerations on her eyelids. As of Sunday evening, Del Rosario said that Garcia and his niece were at Stanford Hospital, awake and "in their usual spirits." Minutes before the branch toppled, about two dozen adults and children were seated where the tree limb fell, but they had moved to participate in an activity, according to fire officials. "I know the fire crews that responded to this incident were extremely relieved that it wasn't much worse than it could have been given the size of the group and proximity of the seating area under the tree," Fire Chief Harold Schapelhouman said in a statement. Fire officials plan to follow up with the college regarding tree inspections this week.